As Montana's leading business bank, we are well positioned to help you manage the growth of your business. Our way of banking lays the foundation for a highly successful long-term partnership with you. Expertise in multifamily housing finance for a prime reason: healthy families. For eligible clients, Private Banking services include premium interest rates and your own personal relationship manager. We specialize in helping entrepreneurs grow their businesses or start new ones. Bank of Montana was named one of MSN Money’s 359 Safest Banks in America – one of only three in Montana and the only in Missoula! We are entrepreneurs – building our bank, satisfying our clients, and looking for opportunities to grow, just like our clients. As such, we understand many of your challenges and want to learn about the rest. We strive to fully grasp the needs of every client we work for whether delivering a personal loan or a business loan. We offer solutions driven by customized products and executed by an unrivaled team of professionals. The result is a banking experience custom-tailored to meet your needs. We offer a full range of deposit and loan services, featuring some of the most competitive rates in the country. One of our specialties is government-enhanced loans such as those provided in conjunction with the Montana Board of Investments, the Small Business Administration, the U.S. Department of Agriculture, and other state and federal programs available to businesses in Montana. At Bank of Montana our commitment to exceptional customer service is a standard we honor every day, in every client interaction. We look forward to working with you! Bank of Montana’s Private Bank is a unique banking service available to eligible clients. As a Private Banking client, you will have 24-hour access to your personal relationship manager. Our approach to private banking is defined by our commitment to you and your financial goals. Private Banking clients earn premium interest rates and receive other membership benefits. One of our specialties is government-enhanced loans such as those provided in conjunction with the Montana Board of Investments, the Small Business Administration, the U.S. Department of Agriculture, and other state and federal programs available to businesses in Montana and the United States. We are are the only HUD Multifamily approved lender in a 6-state region. As one of the only specialized aviation lenders in the nation, we know how to finance your aviation needs. As experienced pilots and aircraft lenders, we will quickly identify which loan program best fits your specific situation. We love entrepreneurs. They are the lifeblood of Montana’s economy. And as a business bank, we specialize in helping entrepreneurs grow their businesses or start new ones. What’s more, as entrepreneurs ourselves, we know that all small businesses have unique banking needs. 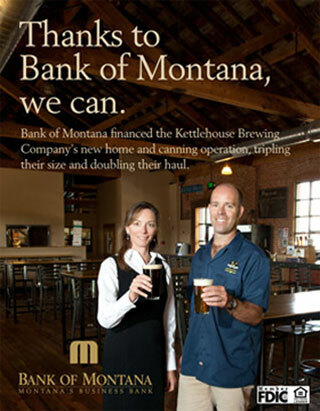 Bank of Montana offers custom loan solutions for your small business. Bank of Montana is the only bank in Montana that is an actual United States Export Import Bank Guaranteed Lender. If you are selling your product internationally, or would like to discuss expanding your business internationally, contact Bank of Montana today.